After a torrid rally in the last two days of a brutal October helped offset some of the losses in the worst month for global equities in more than six years, world markets started off November in a sea of green with gains in Asian and European markets, and S&P futures pointed to a higher open buoyed by upbeat earnings and hope that today's Apple earnings will ease more "growth" and tech stock concerns, while sterling rallied on reports that Britain and the European Union are close to a post-Brexit deal on financial services, even though a government official has since denied the report. After October's drubbing which saw global markets drop 7.5%, their worst month since May 2012, as shares took a battering on a number of factors ranging from trade wars to concerns about the global economy and higher U.S. interest rates, the MSCI All-Country World Index was up 0.3% on the first day of November. 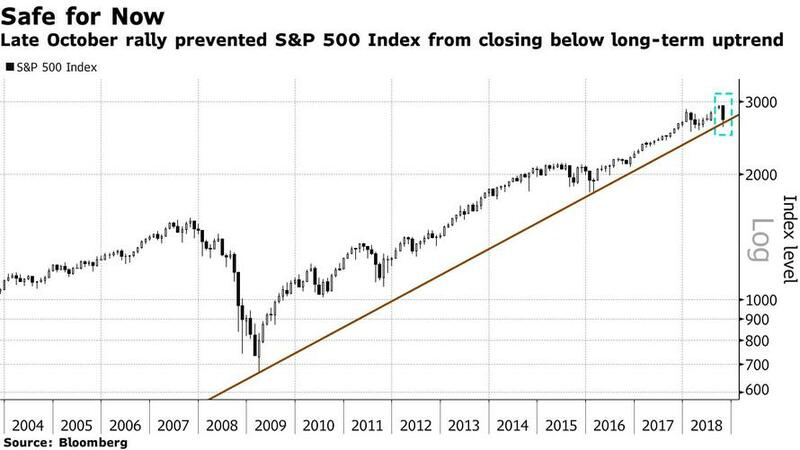 The recent rally has helped the S&P rise above its long-term uptrend. Futures on the S&P 500 jumped after the European open, having traded mixed for much of the overnight session, and rising 0.6% as of 7am ET. European markets followed a strong start in Asia, with robust company earnings helping the pan-European STOXX 600 index hit a two-week high with miners and carmakers leading the way higher. And while strong results from the likes of ING Groep helped push European banking shares higher, not all the news was positive, with Royal Dutch Shell falling after profit fell short of expectations. At the same time, Britain’s FTSE 100 fell 0.1% as the pound strengthened on a report - since denied - that Britain and the EU are close to a deal that would give financial services firms in the UK continued access to European markets once Brexit happens. Earlier in the session, Asian shares also posted advances with MSCI’s index of Asia-Pacific shares outside Japan rising 0.7%, adding to modest gains the previous day. The index had fallen 10.2% in October, its worst monthly performance since August 2015. Earlier in Asia, markets enjoyed Wall Street's improved mood, and rose for a second day on Wednesday as strong company results and bargain hunting of beaten-down technology and internet favorites lifted spirits, despite an air pocket late in the session which cut the Dow's 400 point gain in half in a manner of minutes. Hong Kong’s Hang Seng rose 1.5 percent on Thursday and the Shanghai Composite Index climbed 0.2%, closing barely green after stronger gains earlier in the session. China's yuan rallied from the weakest level in a decade as the country’s leadership signaled that further stimulus measures are being planned. Japan’s Nikkei bucked the trend and slipped 1% following two days of big gains. The big currency mover overnight was the pound, which surged after reports that U.K. and European negotiators have reached a tentative agreement to give U.K. financial services companies access to European markets, however, on Thursday morning this report was denied by a government official, paring some of the gains. Sterling’s rally nudged the dollar off its recent peak, with the DXY index sliding 0.6% to 96.539. The index had spiked to a 16-month high of 97.20 overnight after the ADP report showed U.S. private sector payrolls increased by the most in eight months in October. 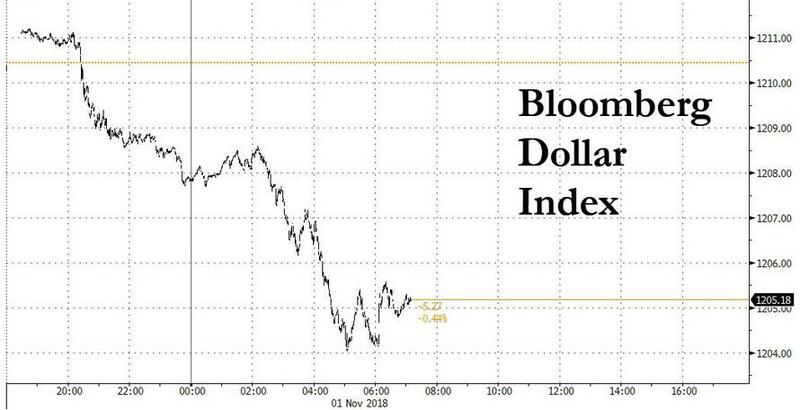 The Bloomberg Dollar Spot Index headed for its biggest loss in nearly three weeks as profit taking was the name of the game, given multiple signals the latest move was overdone versus other Group-of-10 currencies. The Australian dollar and the Kiwi dollar were also sharply higher, rising 1.2% and 1.4% respectively after strong domestic trade data helped offset some of the concerns about slowing growth in China - Australia’s biggest trading partner. 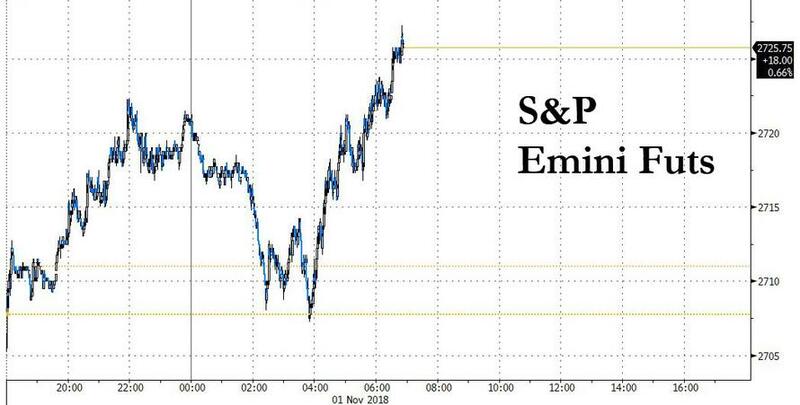 “We’ve got a reasonably risk-friendly market, and with the new month we have some dollar selling,” said Kit Juckes, a strategist at Societe Generale. The Scandinavian currencies - the Norwegian crown and Swedish crown - a proxy for overall risk, also rallied as did the euro, which rose over half a percent to $1.1376 after retreating to $1.1302 on Wednesday, its lowest since mid-August. The single currency has been weighed by less-than-stellar economic news from the euro zone. In commodities, WTI futures were down 0.86 percent at $64.75 per barrel after its worst month in more than two years, and Brent crude lost 1.13 percent to $74.19 per barrel. The two benchmarks remained on the back foot after falling more than $10 from a four-year peak reached early in October as broader market ructions were seen hurting demand for fuel. The focus now turns to Apple earnings Thursday, then to the monthly U.S. jobs report Friday. Other expected data highlights include initial jobless claims and manufacturing PMI readings from Markit and ISM. In addition to Apple, DowDuPont and Starbucks are among companies set to report earnings. Asia equity markets traded mostly higher as the region sustained the momentum from Wall St where stocks continued to pare back some of the losses from its worst monthly performance in 7 years, helped on the day by month-end rebalancing and with sentiment also underpinned by strong jobs data as well as a rally across FAANG stocks post-Facebook earnings beat. ASX 200 (+0.2%) was lifted by early outperformance in the mining sector as BHP shares gained on the announcement of a USD 10.4bln shareholder return program, although upside was capped by indecisiveness across financials amid less than inspiring NAB results and M&A hopes with Macquarie said to be mulling an offer for AMP Capital. Elsewhere, Nikkei 225 (-1.0%) was pressured by the recent currency strength and with much of the focus on earnings, while Shanghai Comp. (+0.6%) and Hang Seng (+1.8%) outperformed following the better than expected Chinese Caixin Manufacturing PMI data and continued supportive efforts by Chinese authorities. Finally, 10yr JGBs were lower with yields higher across the curve after the BoJ tweaked its monthly bond purchases in which it cut the number of occasions it will buy 1-3yr and 3-5yr JGBs to just 4 times from 5 times per month, although firmer demand at the 10yr auction helped stem losses. 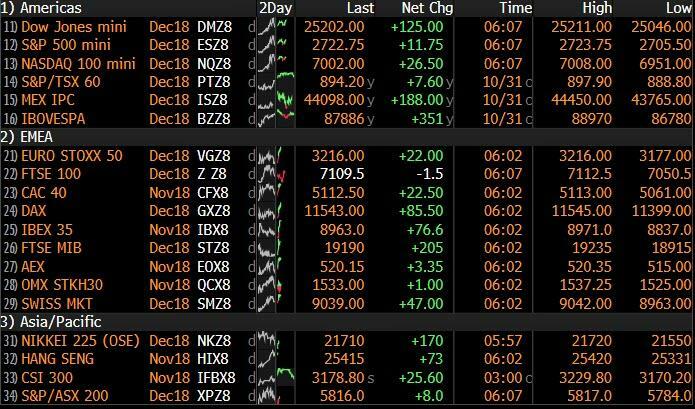 European equities trade mostly higher (Eurostoxx 50 +0.8%) after erasing initial losses as sentiment from Asian and Wall Street translated onto the region. The pan-European Stoxx 600 (+0.7%) is fuelled by earnings with the likes of BT (+10.2%), ASM (+15.0%) and Smith & Nephew (+7.0%) all near the top of the index. In terms of sectors, energy names are lagging, in-fitting with the price action in the complex, while telecom names outperform after BT raised their EBITDA guidance. In terms of US earnings on the docket, traders will be keeping an eye on tech-giant Apple who are due to report after market. In FX, all change for the USD and index just a day after month end when the Greenback outperformed due to multiple bullish factors and the DXY finally breached 97.000 to register a fresh ytd peak of 97.201. However, a broad upturn in risk sentiment, portfolio re-positioning and some specific impulses have prompted a marked turnaround with the index back down to 96.510 ahead of a busy agenda before NFP on Friday. NZD/AUD/SEK/NOK - The clear G10 front-runners, or heading the widespread recovery charge vs the Usd, as the Kiwi tops 0.6600 with the aid of favourable cross-winds even though the Aud is testing stops around 0.7160 against its US counterpart and holding above 1.0800 within a 1.0820-75 range after significantly better than expected Aussie trade data overnight. Meanwhile, the Swedish Krona is outpacing its Norwegian peer amidst the aforementioned rebound in risk appetite, and both getting some additional impetus from firmer than forecast manufacturing PMIs, as Eur/Sek retreats through 10.3000 and Eur/Nok tests bids ahead of 9.5000. GBP - A few negative/less bullish developments after Wednesday’s Brexit boost, with Nationwide UK house prices slowing to multi-year lows, the manufacturing PMI considerably below consensus and the Brexit Ministry playing down reports about a deal being done and dusted for domestic financial services firms maintaining access to EU markets post-withdrawal, though progress towards an arrangement along ‘equivalence’ lines seems certain. Hence, Cable is back under 1.2900 and through the 10 DMA (around 1.2873) having rallied over a key Fib (1.2911) to test the first line of offers seen between 1.2920-25, and with stops reputedly above 1.2930 on a break. Next up, BoE super Thursday from noon. JPY - Flat and rangy between 113.00-112.75 in contrast to other majors, but with decent expiry interest from 112.45-50 (1 bn) and better risk sentiment on balance likely to keep the headline pair underpinned. EM - Regional currencies are all benefiting from the general Dollar pull-back, but with the Rand outperforming and testing offers/resistance ahead of 14.5000. In commodities, WTI (-0.7%) and Brent (-1.0%) are lower with the complex extending on yesterday’s losses over rising supply concerns; and subsequently comments from US President Trump that there is sufficient supply to allow for a significant reduction in purchases from Iran. Analysts from Huatai stating that oil investors are now betting on the potential for a global slowdown. Additionally, Goldman Sachs have reiterated their year-end Brent forecast at USD 80/bbl. Gold (+0.8%) prices have rebounded after hitting a 3-week low in the previous session, largely due to marginal dollar weakness. According to the World Gold Council, the yellow metal’s Q3 global demand is slightly higher year-on-year. Elsewhere, aluminium hit a new two year low, following the weak Chinese PMIs on Wednesday and concerns over the US-Sino trade war’s potential impact on global demand. Looking at the day ahead, we get the preliminary Q3 nonfarm productivity and unit labour cost releases, the latest weekly initial jobless claims print, final revision to the October manufacturing PMI, September construction spending, ISM manufacturing and then October vehicle sales data. Away from all that the big earnings release today is Apple when we’re due to get numbers at the close, while Royal Dutch Shell, Dow Dupont, Kraft Heinz and Credit Suisse are other notable highlights. What is it about Octobers? History is quite clear that Octobers are by no means always bad, but when they are bad they have a tendency to be quite bad or at least more volatile! Normally we publish our MTD and YTD performance review on the first of every month in the EMR but because the past month has seen such big and interesting moves we felt that the review deserved a standalone piece. In particular in the review today we will show that if the year ended now, we’d be set for a record % of assets in our universe in negative territory in dollar terms for a year. This follows last year, when the exact opposite was true. Of the assets we track, we saw the least number in negative territory in dollar terms in 2017. This perhaps highlights a world where we’ve moved from peak QE and everything being expensive to QT over the last 2 years. For this analysis we’ve used the data we collate for our long term study and go back to 1901. So this will be published slightly later this morning along with all the usual stats. However as an interesting aside, in today’s pdf in the EMR we show the typical daily progression of the S&P 500 through the average year using daily data back to 1927. The average year sees the S&P gain +7.53% on a price basis using this data. However by September 6th, the average year has already seen the index climb +6.05%. Over the course of the next 7 weeks this falls back to +4.70% by October 27th. To be fair, September is worse from a performance basis but October has seen bigger ranges. After these two months are left behind, we then see the usual Santa Claus rally and average gains of nearly +3% into YE on average. Highlighting the fact that volatility increases we also show the +/- 1 standard deviation of the move over the course of the year. The graph quite clearly shows how the range of outcomes increases dramatically in October before calming down through November and December. Why this happens we still don’t know after over 20 years of observing this trend, but 2018 has further advanced the legend of Octobers being difficult. So click on the link for these graphs and watch out for the performance review slightly later this morning. There’s something ironic about the fact that despite the S&P 500 just having its worst monthly performance since September 2011, the two-day rally into month end of +2.67% which included a climb of +1.09% yesterday was the biggest since February and the third biggest since June 2016. The two-day climb for the NASDAQ of +3.63% was the biggest since June 2016 (following a +2.01% rally yesterday) although in fairness the index is only now just back to within 10% of its all-time closing high back in August while the NYSE FANG index has rallied +5.54% over the last two days (following a climb of +3.59% yesterday) – the biggest two-day gain since February 2016. So an impressive turnaround which at least has helped to limit some of the damage done in October. Europe also got swept up in the risk-on tone yesterday with the STOXX 600, DAX, CAC and FTSE 100 climbing +1.71%, +1.42%, +2.31% and +1.31% respectively. Italy unperformed but the FTSE MIB did still nudge up +0.27% and BTPs finished -4.6bps lower in yield following an Il Sole report in the morning which suggested that the Italian government may try to make the case to the EU that the ‘effective’ budget may be closer to 2% for 2019 versus the current 2.4% draft when taking into account slowing growth and lower spending on pensions and the planned citizens income. Overnight in Asia we’ve seen markets extend on yesterday’s gains with the exception of Japan where the Nikkei (-0.88%) and Topix (-0.69%) have struggled with the telecoms sector down around 8% following news of heavy prices cuts on mobile plans. Away from that however the Hang Seng (+1.84%), Shanghai Comp (+1.13%) and Kospi (+0.47%) are all higher along with S&P 500 futures (+0.30%). A more or less in-line Caixin manufacturing PMI in China (50.1 vs. 50.0 expected) was confirmed this morning however notably we did see PMIs fall below 50 in Taiwan, Malaysia and Thailand overnight for the month of October – all export driven economies and signs therefore of the impact of the trade war on the wider region. Back to yesterday where EM FX (-0.33%) actually weakened despite the move for equities with the likes of the South African Rand (-1.29%), Mexican Peso (-1.40%) and Brazilian Real (-0.68%) all under pressure. The Turkish Lira (-1.92%) underperformed, as the government announced a new suite of substantial tax cuts. 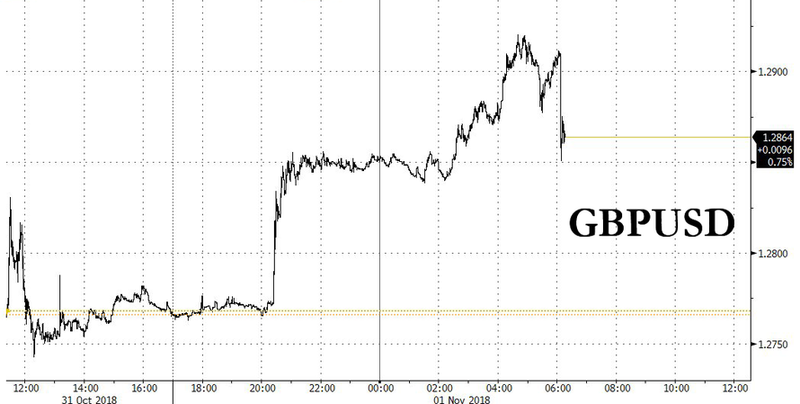 Treasuries nudged up another +2.1bps after the US Treasury Department refunding announcement largely met expectations, while there was a similar move for Bunds (+1.6bps) while WTI Oil fell another -1.31% and edged lower for the third consecutive session. Gold and Silver also fell -0.67% and -1.55% respectively as risk-off dissipated. There wasn’t really a lot of new news to drive markets yesterday although the tech sector was certainly at the heart of it aided by Facebook’s (+3.81%) earnings post the close on Tuesday. Netflix climbed +5.59%, Alphabet +3.91% and Amazon +4.42%. As you’ll see in the day ahead we’ve got Apple’s earnings later this evening so expect another decent test for the sector. Yesterday we got stronger than expected earnings from 25 out of the 34 companies that reported in the S&P 500 with 25 also beating on revenues. The narrative around this earnings season has focused on the downward revisions to guidance, but our US equity strategy team argues in a note last night that this earnings season is largely a return to historical averages, and that underlying earnings growth remains strong. Beats are around their historical norms, and headline margins continue to climb to record highs. Buybacks continue their blistering pace as companies continue to return capital to investors, though companies are also paying down debt. In the US, our economists have updated their various market-based models, and conclude that the risks of a recession over the next 12 months is right around its historical average of 15%. We would have sympathy with this but with QT in full force things could look different in 12 months’ time. Their full note is available here. 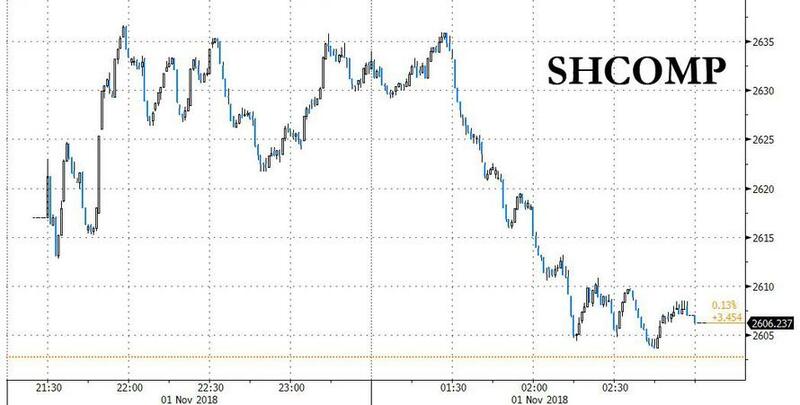 Meanwhile, yesterday’s headlines out of the Politburo in China suggesting that more stimulus may be on the way is perhaps helping sentiment overnight, however our economists thought the message from the official press release was subtle. They note that the government did recognise the economic slowdown and promised to take "timely actions", as widely reported by journalists. But the government also mentioned that (1) the focus of the economy has moved from speed to quality; and more importantly (2) some policies have been released, and their effect will be transmitted to the economy with a lag. Our economists think that these subtle messages suggest likely disagreements in the government. They highlight that while some may be worried about the downside risk to the economy, others may argue the slowdown is natural and push against aggressive policy easing. You can find more in our colleagues’ report here. Today we will see the BoE meeting at lunchtime. Neither we nor the market are expecting any policy changes with rising external risks and lack of clarity on a transition deal however our UK economists do expect Governor Carney to talk up market pricing of a rate hike next year on the back of stronger wage and output growth in Q3 which should make him sound marginally hawkish. As far as the inflation report is concerned only marginal tweaks are likely compared to the September forecasts. Speaking of Brexit, Sterling has had a fairly strong last 36 hours. Yesterday the currency strengthened +0.47% following a Bloomberg report in the late afternoon suggesting that Brexit Minister Raab expects a Brexit deal by November 21. However, upon closer examination, this turned out to be a bit of a misleading headline and the pound quickly retraced the some of the move. The letter being cited was a week old and merely said the Raab would be willing to testify to the Brexit Committee on November 21 which could be a suitable date after a deal was struck. But the details were vaguer than the headline. Overnight however Sterling is up another +0.60% and back above $1.280 following a report in the Times suggesting that the UK and Europe have tentatively agreed to all aspects of a future deal on services which would include the EU guaranteeing UK companies access to markets in Europe as long as financial regulation in the UK remained broadly aligned with Europe. Expect some reaction to that today. Elsewhere in Europe, the race to replace German Chancellor Merkel as party leader is on, with Friedrich Merz giving a long news conference in Berlin to introduce his candidacy. Merz has been out of parliament since 2009, but he is one of the three frontrunners to succeed Merkel. He did not offer any surprising policy positions in his remarks, focusing his remarks on the need for party unity and for including younger voters and women in the process. On the data front, preliminary October Euro Area CPI printed in line with expectations at +2.2% headline and +1.1% core, from +2.1% and +0.9%, respectively. French and Italian October CPI both printed 0.1pp lower that forecast, at +2.5% and +1.7% respectively. In Germany, September retail sales rose +0.1% mom, less than the +0.5% expected, and, when combined with downward revisions to prior months and a substantial base effect, equal to a -2.6% yoy decline. So further evidence of third quarter softness in Germany. Before turning to today's calendar, it's worth a look ahead to next week's major event: the US midterm election. Our US team has updated their analysis of the polls, betting odds, and markets ahead of the vote. It looks probable that the Democrats will take control of the House, while the Republicans are likely to retain control of the Senate. The policy implications are a bit ambiguous, as trade policy - the most important area for markets - is somewhat disconnected from the legislature. As far as the day ahead is concerned then, this morning in Europe we’ll get October house prices data in the UK followed closely by the UK’s manufacturing PMI. Focus should stay here into lunch with the aforementioned BoE meeting before this afternoon in the US we get the preliminary Q3 nonfarm productivity and unit labour cost releases, the latest weekly initial jobless claims print, final revision to the October manufacturing PMI, September construction spending, ISM manufacturing and then October vehicle sales data. Away from all that the big earnings release today is Apple when we’re due to get numbers at the close, while Royal Dutch Shell, Dow Dupont, Kraft Heinz and Credit Suisse are other notable highlights.